Spectrum works with hundreds of single and multi-location quick serve restaurants across the country including some of the nation’s most recognized franchise brands. Each brand uses a different array of mailer sizes and formats, frequency to the mailbox, special offers, and customer targeting methods that we have determined are successful for them. You can learn more about our restaurant industry mail programs here. While each brand has unique marketing goals, every approach to direct mail is unique. Here are some common direct marketing strategies that continue to yield superior RESULTS for our quick serve restaurant clients. Coupon offers are a great way to communicate with your customers – and gain new ones. Consider this: Over half of consumers use a coupon in at least one of every four purchases (RetailMeNot) Coupons are a great way to reward repeat customers – you can even tailor your coupons to your customers so that they receive the best offers you have to give! 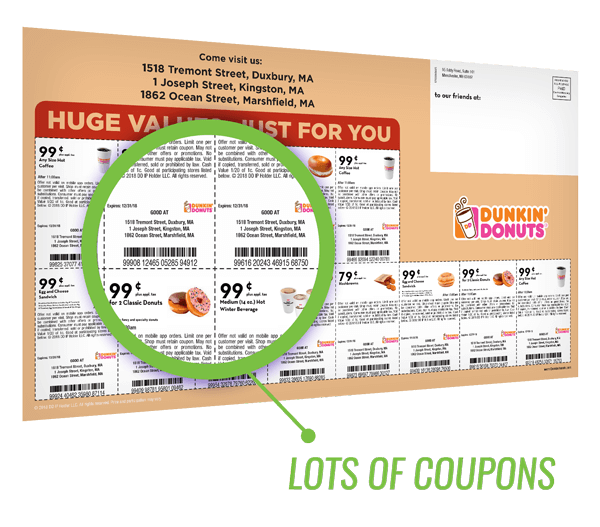 Coupons are also a great way to entice prospects into trying your products. A whopping 78% of consumers said that the would be influenced to buy a brand they wouldn’t typically buy because of a coupon (Valassis). If you’re not using coupons, you’re probably missing out on earning new prospects, as well as keeping your loyal customers. Multiple coupon offers for various items, or staggered for different weeks with different expiration dates. Obviously, the bigger the direct mail piece, the greater than chance of being noticed in the array of mail pieces that arrive daily in your mailbox. However, did you know that prospects are 15% more likely to respond to an oversized mail piece if they have never done business with you? 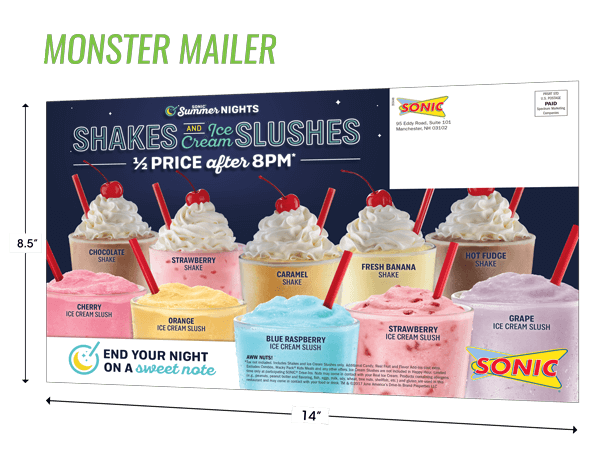 Spectrum has a number of oversized mail formats, like the Monster Mailer, which at 8.5″ x 14″ , there aren’t many formats larger that fit perfectly in both urban and rural mailboxes. Consider changing to a oversized mail piece and turn your existing 3 second reader into a 30 second reader! Our 8.5”x 14” Monster Mailers dominate the mailbox! Use high-quality photography and images of the options on your menu to highlight on your mail piece. Consumers are driven to purchase through attractive design and bold imagery. 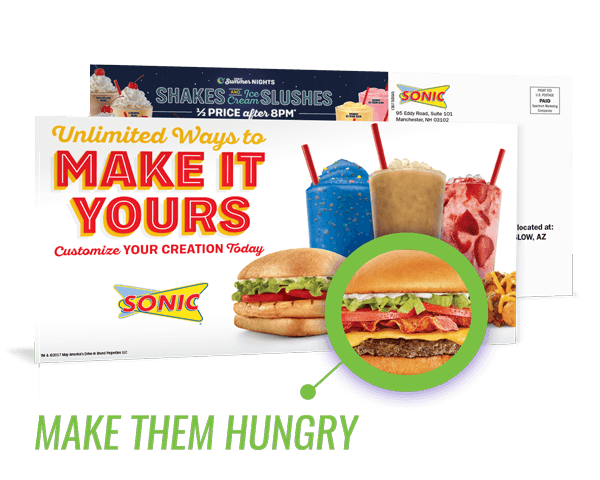 Especially with quick serve restaurant direct marketing, there’s a big opportunity to be had with the use of oversized direct mail formats combined with professionally taken food images. With more real estate on an oversized direct mail piece, you can showcase more of your menu options, upsells and best sellers. Don’t forget the coupons that tie in with your direct mail piece’s photography! Use oversized mailers that have plenty of space to show lots of great food choices. 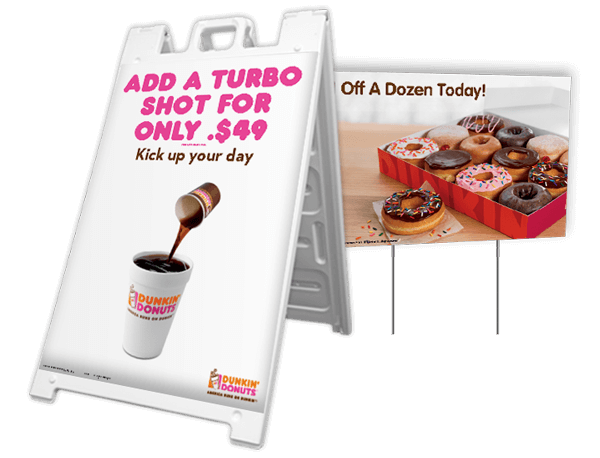 Finally, coordinate your quick serve direct marketing with your in-store signage for maximum results! Banner-ups, mesh window clings, and counter cards are just a few of the ways you can enhance your customer’s experience at the point-of-purchase to drive them to buy. 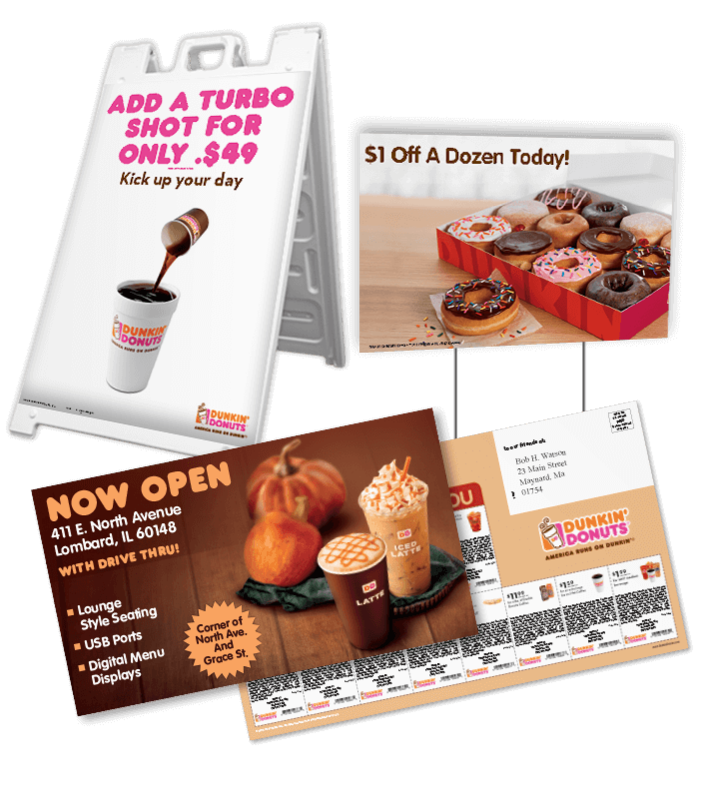 Making sure that your POP signage is strategically placed is just as important as matching the message on your direct mail piece, so consider where in your establishment would best help convert that customer to make a purchase. Not sure on where to place your POP signage for maximum effect? Let our industry experts help! Implement in-store signage with a coordinated message to lift awareness and further increase response.